@ManojChandra: Yes, that is a big issue. This track doesn't suit Williams like Monza or Spa, but I didn't expect to see them so far back. 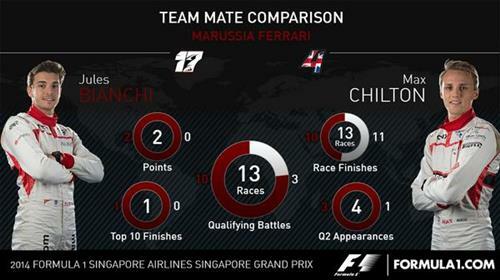 That's an interesting comparison between the Marussia drivers. Chilton has nothing on Bianchi in qualifying but is beating his team-mate in races so far this year. The clock is ticking and it is Bianchi who emerges first from the pit lane. Conditions are typical Singapore, warm and humid but crucially the track is dry for the start of FP3. Looks like it should stay that way, too. Lots of drivers coming out of the pits. Raikkonen has to take some early evasive action to avoid the slow-moving Gutierrez. That will please the Finn, I imagine. For teams like Marussia, it really won't matter where either driver finishes unless its higher than what Bianchi achieved in Monaco. Hi Nate, what did you think of removal of Singapore Sling last year? Did that improve the race in any way? It was such a unique corner, although stressful on drivers! @KaiJin: I think it was a pretty dangerous corner, and unnecessarily dangerous too. When drivers are unanimously against it, I think a corner has had its day. Lots of installation laps completed, so those early runners head back into the pit lane. Hi Nate, where will be Red Bull`s best chance to challenge Mercedes? Today in qualifying or tomorrow? @Kristiyan: I think over one lap they have a real chance if they can cut that gap down a bit. Race pace is the big question-mark at the moment. Everyone coming out first are doing so on a soft set of tyres. were williams affected by maldonado's crash like rosberg?? @SaranSayee: Neither driver said as much, they were more concerned with their pace either side of that red flag. maldonado should have exception from radio ban, he must get as much help possible from pit to avoid crash. Remember, this session is crucial in sorting the pecking order we can expect for qualifying later. The teams use this session to find the perfect balance between a quali and race set-up. Gutierrez tells Sauber the grip is really poor, possibly due to the rain this morning. Magnussen has set the first benchmark, a 1:51.985.
why was Nico slow in FP2? @KrishnaTeja: He was on his timed lap when Maldonado decided to put his Lotus in the wall, so he had to abort the lap. Given how quickly you lose the super-soft tyres in terms of one-lap pace, it meant he couldn't post a competitive time. Button slots in two tenths down on his team-mate. But poor maldonado has gone from a team which was struggling with a bad car to , another team which is having a very bad car.. Atleast he should get a not-so-difficult-car-to-drive team ..
@Nate, was Rosberg as concerned as Hamilton was yesterday about car perfomance? And what was Rosberg race sim compared to Ham`s? @Kristiyan: He certainly thought his aborted lap left him with more work to do. Hamilton wasn't really concerned with the pace, he just wasn't happy with the feel of the car overall. Race pace was actually in Rosberg's favour - but of course, as always, we don't know the fuel of each car so it's hard to make accurate comparisons. Ricciardo the first of the expected front-runners to start a flying lap. Ricciardo really throws his Red Bull around here, even this early in the session, and again is getting closer and closer to the wall. Button's latest time sees him jump above Magnussen into P1. can you predict first retirement of the race? Ricciardo's first proper lap sees him leap to the top of the timing screens by some margin, a 1:50.762 some seven tenths quicker than anyone else. And the Australian's lap looked quite scruffy. Gday Nate, do you happen to know how much running Vettels replacement Engine has had prior to being refitted ? @LD: G'day. Renault said the engine was "at something like half-life" and were surprised it failed so early. His current engine is the one used in Hungary. A penalty later this season now looks inevitable. I'm sure Bernie can type if he needs to, but he'll have someone to do that for him. Vettel slots in behind Ricciardo, who has improved on his first time to 1:49.588. Remember the tyres get quicker and quicker so shouldn't compare runs when drivers have done different amount of laps. Love the editing Mod. You rock ! !